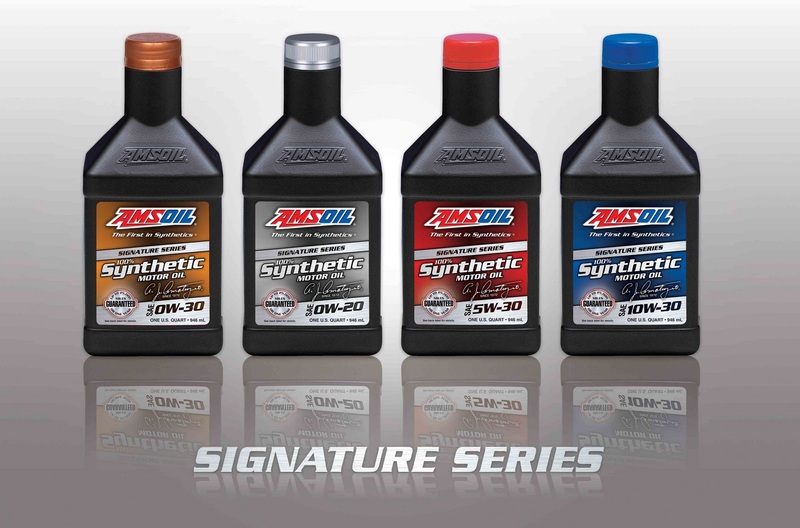 AMSOIL 0W-20 (ASM), 5W-30 (ASL) and 10W-30 (ATM) Synthetic Motor Oils join AMSOIL Signature Series 0W-30 to round out the new Signature Series line. Signature Series 0W-30 is now identified by product code AZO. Product code SSO is discontinued. With the recent introduction of OE Synthetic Motor Oil and the recent reformulation of XL Synthetic Motor Oil, Signature Series Synthetic Motor Oil provides AMSOIL Dealers with three distinct lines of high-quality synthetic motor oil, allowing them to appeal to every customer type they encounter. Notes: The new Signature Series line is replacing the previous formulations of the AMSOIL top-tier oils as inventories dictate; orders will be filled with the older formulations and packaging until inventory is depleted, which may occur at varying times for each viscosity. The new Signature Series 0W-30 (AZO) sells at a lower price than the previous Signature Series 0W-30 formulation (SSO). The former Signature Series 0W-30 formulation (SSO) is available while supplies last. AMSOIL Synthetic 20W-50 Motorcycle Oil (MCV) is recommended for air- or liquid-cooled four-stroke engines, including Harley-Davidson®, Buell®, KTM, Ducati®, Aprilia®, BMW®, Triumph® and other motorcycles specifying 15W-50 or 20W-50 engine oil or SAE 90, GL-1 gear oil. Its superior shear stability provides unsurpassed protection for high performance engines, transmissions and primary chaincases, performing like gear lube without the negative effects extreme-pressure additives. AMSOIL Synthetic 10W-40 Motorcycle Oil (MCF) is recommended for liquid- or air-cooled four-stroke engines, including Honda®, Kawasaki®, Yamaha®, Suzuki®, BMW®, Husqvarna®, Victory® and other motorcycles specifying 10W-40 or 20W-engine oil or SAE 80W/90, GL-1 gear oil. Its superior shear stability provides unsurpassed protection for high-performance engines and transmissions, performing like a gear lube without the negative effects of extreme-pressure additives. AMSOIL 10W-40 Motorcycle Oil provides maximum wear protection regardless of the operating conditions, resisting breakdown and sludge and carbon deposits. It provides extended service life of up to twice the manufacturerrecommended change interval (miles/hours) or one year, whichever comes first. AMSOIL Synthetic SAE 60 Motorcycle Oil (MCS) is recommended for early-model air-cooled V-Twin engines, including Harley-Davidson® Knucklehead, Panhead, Shovelhead and big-bore motorcycles specifying 60-weight motor oil or SAE 140, GL-1 gear oil. Its superior shear stability provides unsurpassed protection for high-performance engines and transmissions, performing like a gear lube without the negative effects of extreme-pressure additives. 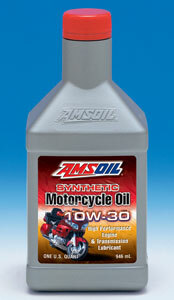 AMSOIL Synthetic 10W-30 Motorcycle Oil (MCT) is recommended for liquid or air-cooled four-stroke engines, including Honda®, Kawasaki®, Yamaha® and Suzuki® motorcycles and scooters, as well as Arctic Cat®, Can-Am®, Honda®, Kawasaki® and Suzuki® ATVs and UTVs, specifying 10W-30 engine oil or SAE 80, GL-1 gear oil. Its superior shear stability provides unsurpassed protection for high-performance engines and transmissions, performing like a gear lube without the negative effects of extreme-pressure additives. AMSOIL 10W-30 Motorcycle Oil provides maximum wear protection regardless of the operating conditions, while resisting breakdown and damaging sludge and carbon deposits. It provides extended service life of up to twice the manufacturer- recommended change interval (miles/hours) or one year, whichever comes first. With the price of gas surpassing $3 per gallon and expected to continue increasing, motorists are once again trying to squeeze as many miles from a tankful of gas as possible. Some may turn to questionable products that tout impressive fuel economy gains but cannot live up to the marketing hype. AMSOIL P.i. Performance Improver, on the other hand, offers proven performance. It increases fuel economy, reduces emissions and restores vehicle power and performance by dissolving and removing combustion chamber, intake valve and fuel injector deposits. In fact, field testing shows AMSOIL P.i. provides an average fuel economy improvement of 2.3 percent and up to 5.7 percent (see graph). Because of this substantiation, as well as the company’s confidence in the performance benefits of P.i., AMSOIL is offering a money-back guarantee on the product’s fuel economy benefits. If a customer does not see fuel economy improvement in his or her vehicle after first-time use of P.i., AMSOIL will refund the purchase price of the product. The P.i. money-back guarantee begins March 1 and is good through May 31. It is open to everyone, including Dealers, Preferred Customers, retail customers, catalog customers, commercial and retail accounts. Because the most dramatic fuel economy improvement is achieved after first-time use of P.i. in a vehicle with accumulated deposits, the P.i. money-back guarantee is limited to vehicles with a minimum of 25,000 miles that have not previously been treated with P.i. and have not undergone any fuel system or fuel injector cleaning procedure. P.i. must be used with a full tank of gas, and the P.i.-treated gas must be run until the tank is near-empty before filling up again. Fuel economy measurement will then be taken on the tankful of gas following the P.i.-treated tank of gas. Because potential customers have nothing to lose, the P.i. money-back guarantee is an excellent opportunity for Dealers to increase their sales of P.i. and other AMSOIL products. P.i. is an ideal door-opener. Once customers experience the benefits, they may be interested in the benefits of other AMSOIL products. The goals for this demonstration included showing that the use of AMSOIL Series 3000 5W-30 Heavy Duty Diesel Oil, in conjunction with the AMSOIL Dual-Gard filtration setup and SDF Oil Filters, would result in improved efficiency, reduced operating costs and environmental benefits when compared to conventional petroleum lubricants and filtration methods. As mentioned, the evaluation was conducted using a 1995 Freightliner FD-120 equipped with a Detroit 60 Series diesel engine. The AMSOIL Series 3000 5W-30 Heavy Duty Diesel Oil was sampled at the manufacturer’s suggested oil drain intervals and monitored through the use of oil analysis to ensure its continued serviceability. The full-flow filtration units were also monitored and replaced at 12,000- to 15,000-mile intervals, while the By-Pass units were monitored and replaced at 24,000- to 30,000-mile intervals. Overall, the demonstration was a success. After switching to AMSOIL Series 3000 5W-30 Heavy Duty Diesel Oil (and later AMSOIL 75W-90 Gear Lube in the differentials and Power-Shift Transmission Fluid in the Transmission), the truck experienced significant declines in wear rates and an eight percent increase in fuel economy. 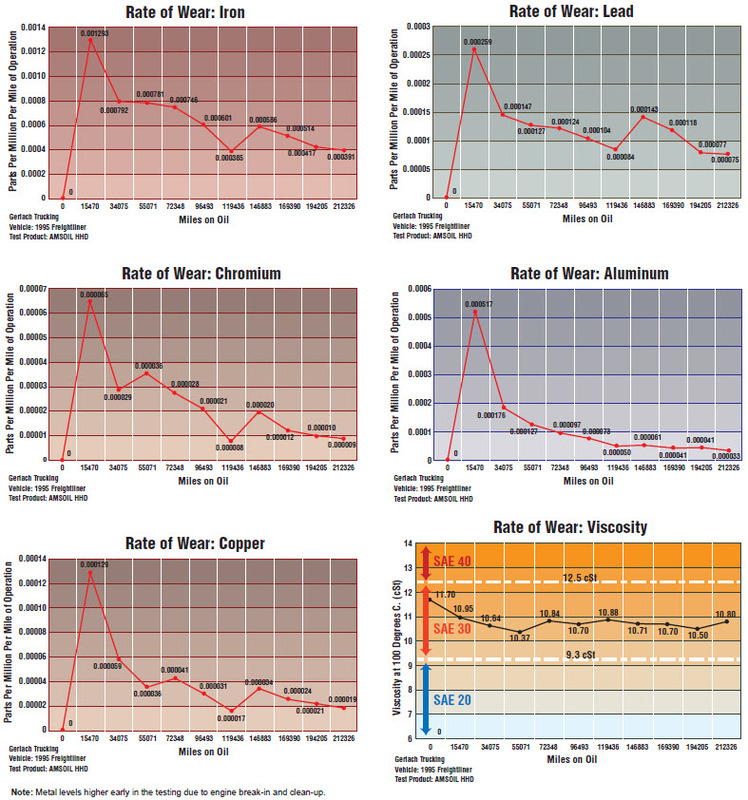 The pictured charts show individual rates of wear throughout the two-year demonstration. As the engine wear rates were reduced, operating efficiency rose, leading to an increase in the life of the engine and decreasing operating costs. Even with 212,326 miles on the oil, there was no indication it needed changing. Because of the extended drain capabilities of AMSOIL Series 3000 5W-30 Heavy Duty Diesel Oil, the negative effects of used oil on the environment were also significantly reduced. If it had been using conventional petroleum diesel oil, which usually requires replacement approximately every 18,000 miles, this application would have required up to 12 oil changes and 480 quarts of oil over the demonstration running time of 212,326 miles, compared to just one oil change and 40 quarts of oil using AMSOIL Series 3000 5W-30 Heavy Duty Diesel Oil and Dual-Gard filtration system. Overall, the data demonstrates that AMSOIL Series 3000 5W-30 Heavy Duty Diesel Oil is capable of providing extended drain service for a period well beyond recommended drain intervals, while also significantly decreasing wear rates, operating costs and environmental waste. AMSOIL Dealers armed with a detailed understanding of grease-related suffering points and the benefits of AMSOIL Synthetic Polymeric Off-Road Grease can successfully address customer concerns and increase grease sales. There are dozens of zerks on a variety of heavyduty applications. Many zerk fittings are not only difficult to locate, but difficult to grease, even for experienced maintenance personnel. 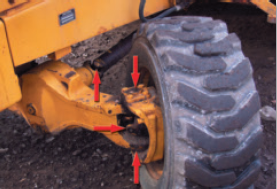 A multitude of hard-tolocate fittings presents serious potential for missed grease points, causing drastic increases in component wear that can lead to component failure and equipment downtime. AMSOIL Synthetic Polymeric Grease provides the extra level of protection necessary to help overcome the problems associated with missed grease points and skipped lubrication intervals, staying in place longer and providing better lubrication for extended periods. By providing a safety margin for when grease points are missed, AMSOIL Synthetic Polymeric Grease allows extended equipment life and peace of mind, even during severe-service operation. In addition, AMSOIL Synthetic Polymeric Grease is formulated with 5 percent molybdenum disulfide (moly) for an extra level of protection, actively separating metal components when lubrication intervals are skipped. 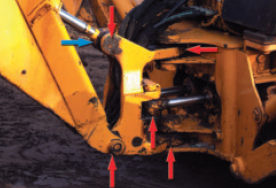 The repetitive pounding action of everyday operation puts severe strain on equipment pivot points, causing inferior greases to pound out of place. When pound-out occurs, there is no base oil to provide proper separation of metal components, leading to increased wear, and no seal to keep water and abrasive contaminants out, leading to rust, corrosion, pitting and component failure. AMSOIL Synthetic Polymeric Grease effectively resists pound-out and keeps equipment properly lubricated during extreme-pressure shock-loading and high-impact operation. The AMSOIL Impact Simulator (G2713) can be used to effectively measure a grease’s pound-out resistance. See back cover for more information or see the video demonstration at www.amsoil.com. 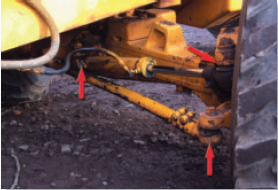 Water Washout and Contaminant Ingress Grease in heavy equipment is often subjected to environmental contaminants, including water. When inferior grease is exposed to water, it presents major potential for washout, or grease washing off the equipment components. This not only increases metal-to-metal contact and wear, but also the potential for rust and corrosion. AMSOIL Synthetic Polymeric Grease has exceptional adhesion and cohesion properties, allowing it to remain in place during wet operation and cleaning. It also provides one of the best water washout test (ASTM D1264) values in the industry (1%), effectively protecting metal components from the harmful effects of water contamination. By providing superior sealing ability, AMSOIL Synthetic Polymeric Grease also overcomes problems created through contaminant ingress, actively deterring abrasive contaminants from entering pivot joints and providing better seal protection, maximizing equipment life. AMSOIL Synthetic Polymeric Off-Road Grease is designed to provide superior lubrication, protection and extended service intervals for virtually all off-road equipment grease points, including heavily-loaded pivot points, bushings, articulation points, machine implements, universal joints, driveline grease points, equipment wheel bearings and other grease-lubricated components. 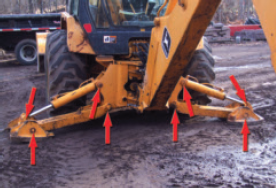 The following pictures present the greasing requirements for a typical backhoe application. 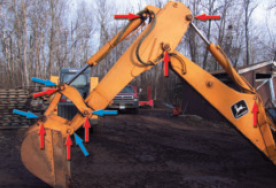 OEM recommendation: Lubricate backhoe arm, stick, bucket, cylinder bearings and linkage every 10 hours. OEM recommendation: Lubricate swing frame every 10 hours. 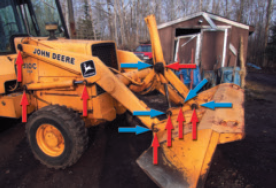 OEM recommendation: Lubricate loader bucket pivot and linkage every 10 hours. OEM recommendation: Lubricate stabilizer bearings and cylinder every 10-50 hours. OEM recommendation: Lubricate axle universal joints and kingpin bearings every 250 hours. AMSOIL Magazine spoke with Executive Vice Presidents Alan Amatuzio and Dean Alexander about the new line of OE Synthetic Motor Oils and the opportunities it presents for Dealers. AMSOIL Magazine: AMSOIL has had a reputation as an extended-drain motor oil company. Why is it now offering a line of motor oils recommended for OEM drain intervals? 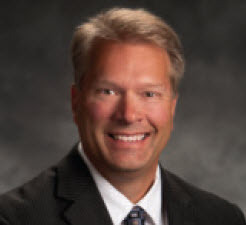 Dean Alexander: AMSOIL is not exclusively an extended-drain motor oil company; it’s a synthetic motor oil company (The First in SyntheticsTM), and our extended-drain oils provide the absolute best value for consumers. AMSOIL OE Synthetic Motor Oils are intended as a door-opener for AMSOIL Dealers. There are many synthetic options on store shelves today, and 92 percent of synthetic motor oil customers are choosing synthetic oils recommended for 3,000-mile or OEM-recommended drain intervals. Whether it’s for the lower initial cost, warranty concerns, API certification or because they’re simply not yet comfortable with extending their drain intervals, that’s 92 percent of the market that we weren’t addressing. Alan Amatuzio: OE gets us into that portion of the market that has been a more difficult sell, and once customers experience the benefits, it will be easier for Dealers to say, ‘If you like the performance of OE, perhaps you’d be interested in an even better AMSOIL product.’ Then, explain the extendeddrain benefits and cost-savings of switching to one of the top-tier AMSOIL synthetic motor oils. In addition, we’re seeing manufacturers recommending longer and longer drain intervals. Most owners’ manuals now recommend drain intervals of at least 5,000 miles. In fact, Ford will recommend 10,000-mile drain intervals with its model-year 2011 vehicles. As OEM-recommended drains continue to increase, more people will turn to synthetics to protect their vehicle investments over these intervals. AMSOIL OE ensures customers’ vehicles receive excellent protection for the entire length of the manufacturer-recommended drain interval, whether it’s 3,000 miles or 10,000 miles. AMSOIL Magazine: How does OE fit into the installer market? Dean Alexander: AMSOIL OE is ideal for the do-it-for-me installer market, which includes quick lubes, car dealerships and other oil change centers. The installer market is growing fast, with an ever-increasing number of customers choosing to pay someone else to change their oil rather than changing it themselves. In fact, the do-it-for-me market is expected to account for 80 percent of oil changes by 2018. AMSOIL motor oil has traditionally been a tough sell in this market due to its extended drain recommendations. Installers balk at offering 25,000-mile/one-year drain intervals that would limit the number of times they see their customers. In order to help Dealers penetrate this market, AMSOIL introduced the Extended Life (XL) Synthetic Motor Oil Program in 1997. XL Synthetic Motor Oils come with API certification and have recently been upgraded from a 7,500-mile/sixmonth drain interval recommendation to a 10,000-mile/six-month drain interval recommendation. By charging customers a premium for this high-quality, extended-drain product, installers have boosted their profits, despite seeing their customers less often. Alan Amatuzio: While many installers have implemented very successful XL programs, many are still resistant to the idea of extended drains. A recent National Oil & Lube News article noted that 90 percent of fast lube operators continue to recommend 3,000-mile drain intervals to their customers. With this in mind, it’s not difficult to see why AMSOIL has sometimes been a difficult sell in the installer market. The new OE line provides installers with another option and Dealers with another tool to increase their sales. The OE line eliminates every potential installer objection, including objections related to price, extended drain intervals, API certification, warranty concerns and frequency of customer visits. And by charging a premium, they make more money than they do on conventional oil changes. 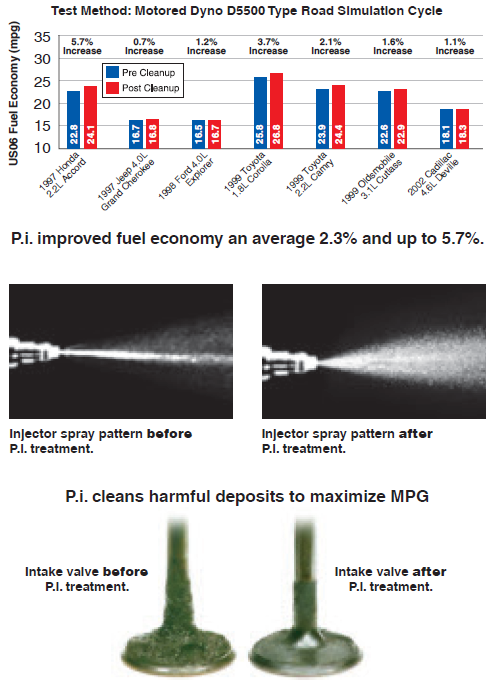 AMSOIL Magazine: How do OE Synthetic Motor Oils measure in terms of quality? Alan Amatuzio: AMSOIL OE Synthetic Motor Oils are formulated to the same high standards as XL Synthetic Motor Oils, but without the extra additive boost required for extended-drain performance. Like the entire line of AMSOIL synthetic motor oils, OE provides outstanding wear protection and fuel economy; resists shear, thermal breakdown, sludge and deposits and provides easier cold-temperature starts and quicker circulation. THE LOWER COST OF OE SYNTHETIC MOTOR OILS IS LESS INTIMIDATING TO NEW CUSTOMERS, AND WILL HELP AMSOIL GAIN MORE NEW CUSTOMERS AS THEY TAKE THAT FIRST STEP FROM PETROLEUM OILS TO SYNTHETICS.? AMSOIL Magazine: How is OE priced compared to competing synthetic products? Dean Alexander: At $5.50 a quart retail [$4.20 wholesale], or $5.39 a quart retail [$3.99 wholesale] when purchased by the case, AMSOIL OE is more competitively priced with other synthetics on the market. This will appeal to customers who recognize the AMSOIL name, know its reputation for quality and have wanted to use the products, but have balked at the higher prices or extended drain intervals of the XL or top-tier line. We all know many customers are driven by price. In today’s economy, price is especially important. That’s not to say price is the only determining factor. Products that combine value and quality, of course, are ideal. AMSOIL is introducing OE to protect the company and its Dealers from low-cost synthetics that are attempting to eat into our market share. People are moving up to synthetics, but many aren’t ready for extended drains. If they’re going to use a synthetic, it needs to be an AMSOIL synthetic. Although AMSOIL sales have been strong and growing, and we expect sales to continue growing in the future, AMSOIL needs to diversify, offer greater opportunities for Dealers and take momentum away from our competitors. The lower cost of OE Synthetic Motor Oils is less intimidating to new customers, and will help AMSOIL gain more new customers as they take that first step from petroleum oils to synthetics. Alan Amatuzio: Again, AMSOIL OE is a stepping stone to our top-tier extendeddrain products. Although the initial price is lower than the price of our top-tier synthetic motor oils and the XL Oils, our top-tier oils provide the best overall value to consumers. For example, a vehicle specifying 5,000-mile oil changes requires five oil changes over 25,000 miles. Let’s say this vehicle takes five quarts of 5W- 30 oil, the customer buys at suggested retail price and performs the oil changes himself. The cost of 5W-30 OE Synthetic Motor Oil (OEF) works out to $27.50 per oil change and $137.50 for the five oil changes required over 25,000 miles. l for 25,000 miles is $45.75. That’s over $90 in savings and doesn’t even take into account the cost of filters or time spent in the garage performing the oil changes. Once OE customers are established, it is examples like these that will help Dealers later upgrade them to a top-tier AMSOIL synthetic motor oil. And that should be the ultimate goal. Experiencing all the benefits associated with the top-tier line is what develops loyal customers. AMSOIL Magazine: How much profit are Dealers poised to earn on OE Synthetic Motor Oils? Dean Alexander: When compared with other AMSOIL products, the profit margins are slimmer per unit, but the profit potential is much greater overall because OE customers change their oil more often. Dealers earn $21.30 retail profit per case of XL, and they earn $16.77 retail profit per case of OE. Consider two customers who each drive 20,000 miles a year and have vehicles with five-quart capacities that specify 5,000-mile drain intervals. Customer A uses AMSOIL XL, with a drain recommendation of up to 10,000 miles, and changes his oil twice a year. The servicing Dealer sells the customer one case of XL a year for a profit of $21.30. Customer B uses AMSOIL OE, recommended for OEM drain intervals, and changes his oil four times a year. The servicing Dealer sells the customer two cases of OE a year for a profit of $33.54. But that’s not the whole story. OE is going to increase Dealers’ earnings exponentially through all of the new customers it will generate. Not only that, but OE is a great choice for many of our current customers who already buy AMSOIL Motorcycle Oils, Formula 4-Stroke Oils, 2-Cycle Oils or filters, but aren’t interested in extending the drain intervals in their cars and trucks. In fact, a full 50 percent of AMSOIL Preferred Customers who made a purchase in the past 12 months did not purchase any passenger car motor oil. AMSOIL OE is a great stepping stone for these people to start experiencing the benefits of AMSOIL motor oil in all their vehicles. The fall months are the time to place boats, motorcycles and lawn care equipment into storage and prepare snowmobiles, snowblowers and other vehicles for the coming winter. AMSOIL Formula 4-Stroke Power Sports Synthetic Motor Oil provides serious protection and performance in four-stroke engines, including ATVs and snowmobiles. Its broad 0W-40 viscosity rating effectively protects in both hot and cold temperature extremes. 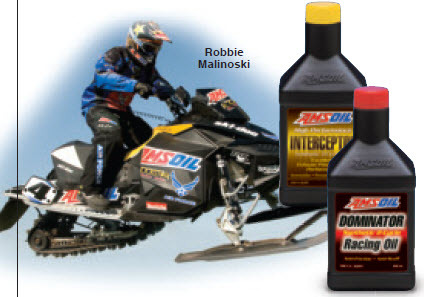 AMSOIL DOMINATOR and INTERCEPTOR Synthetic 2-Cycle Oils provide exceptional performance in snowmobiles and other two-stroke equipment. AMSOIL DOMINATOR is formulated with heavier base oils for “on the edge” operation, while also protecting pistons and bearings subjected to the rigors of extreme riding. AMSOIL INTERCEPTOR is engineered specifically for powersports applications and engines equipped with exhaust power valves. It contains the finest synthetic base oils and additives for exceptional cleanliness, while controlling exhaust valve sticking and providing outstanding overall lubrication. AMSOIL Quickshot SE is formulated to thoroughly clean varnish, gums and insoluble debris in two- and four-stroke gasoline-powered small engines and powersports equipment fuel systems, restoring peak performance. It effectively addresses performance issues related to ethanol, water and dirty pump gas, while stabilizing fuel between uses and during short-term storage periods. The European motor oil market has always been different from the North American market. European engine oil drain intervals have consistently been longer than those in the U.S., and oil formulations and additive packages have also differed from those of North American engine oils. These differences are due primarily to European emissions legislation, fuel economy concerns and stringent severe-service oil durability requirements. In the United States, oil classifications and requirements are developed through a process involving a number of trade associations and organizations, and the classifications are finalized and managed by the American Petroleum Institute (API) and the International Lubricant Standardization and Approval Committee (ILSAC). In Europe, industry wide specifications are developed by the Association des Constructeurs Européens d ‘Automobiles (ACEA). The API-governed engine oil specification has traditionally been the most common in the U.S., and oils meeting current API specs are still widely used today. More recently, ILSAC, which has a more global focus, is having a greater influence on North American specifications due to the rising number of Japanese vehicles sold in the U.S. As a result, the new ILSAC specification, GF-5, differs more from its API counterpart, SN, than in the past. ACEA does not have the recognition and influence in Europe that API does in North America because individual vehicle manufacturers in Europe strongly support their own engine oil specifications. As a result, there are a number of different widely used European engine oil specifications, and oil manufacturers are tasked with building appropriate engine lubes for each. As these new European vehicles make their way to the U.S., consumers are discovering they can’t necessarily use just any oil. One recognized example of a very particular specification is Volkswagen VW 504.00/507.00 (504.00 covers gasoline engines, 507.00 covers diesel engines). This specialized engine oil specification was designed by VW to help protect emissions-reduction equipment and support proper operation and longevity of the vehicle. Until recently, AMSOIL did not offer a product meeting this specification, and there are only a handful of oils available in the U.S. that do. New AMSOIL European Car Formula 5W-30 Synthetic Motor Oil (product code AEL, see p. 13) does meet the spec, as well as the ACEA A3/ B4 specification, which was created with slightly different priorities than the VW 504.00/507.00 spec. ACEA oils engineered for the A3/B4 category meet the requirements of direct-injected gasoline and diesel engines in addition to the requirements of A3/B3. In order to provide optimal performance in direct-injection diesel engines, an oil must be highly stable and durable; direct-injection systems are notoriously hard on engine oil. ACEA A3/B3 European oil specifications require stable, stay-in-grade engine oils to ensure these high-performance engines are protected from inadequate oil supply and excessive wear. For an oil to be considered stay-in-grade, it must resist thickening or thinning out of an established viscosity range. 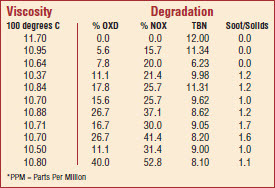 The table below outlines the general differences between four ACEA sequences for gasoline and light-duty diesel oils in regard to fuel economy benefits and drain interval recommendations. Moving forward, Volkswagen plans to maintain three global engine oil specifications for its light-duty gasoline and diesel vehicles: VW 504.00/507.00, VW 502.00/505.01 and VW 501.01/505.00. New AMSOIL European Car Formula 5W-30 Synthetic Motor Oil is recommended for Volkswagen vehicles requiring VW 504.00/507.00, while AMSOIL European Car Formula 5W-40 Synthetic Motor Oil is designed for Volkswagens requiring VW 502.00/505.00/505.01. Both formulations are recommended for the ACEA A3/B4 specification, among others. The ACEA European Oil Sequences define performance requirements for gasoline and light-duty diesel engine motor oil. Each sequence (class and category) reflects different engine oil performance levels. As shown in the chart above, different categories are required to meet key criteria including fuel economy and oil drain interval. AMSOIL OE Synthetic Motor Oils are designed as an entry-level product for customers who want to move up to synthetic quality, but won’t pay a significantly higher price than a conventional product and/or aren’t initially interested in extending their drain intervals. In 1972, AMSOIL pioneered the synthetic lubricant industry by introducing the world’s first synthetic motor oil to pass API service requirements. Because synthetic lubricants were new and revolutionary, the market for them started small. Through the AMSOIL Dealer network, the public was slowly educated on the benefits of AMSOIL synthetic lubricants, attracting loyal high-performance and extended-drain customers along the way. AMSOIL and its Dealers owned the synthetic lubricant market, but as AMSOIL gained momentum, other lubricant companies took notice and developed their own synthetic variations. When Mobil 1 was introduced in 1974, its drain interval recommendation mirrored the AMSOIL recommended drain interval of 25,000 miles or one year, whichever comes first. Although Mobil 1 soon scaled back its drain recommendation, AMSOIL officially had competition in the synthetic motor oil market. As an increasing number of companies have introduced synthetic lubricants through the years, the market has continued to grow. Today, synthetics comprise 7-9 percent of the total lubricant market, a sharp increase from the 5 percent share they held in 2005. Although some are recommended for extended drains, the majority are formulated and recommended for standard 3,000-mile or original equipment manufacturer (OEM)- recommended drain intervals, allowing them to be sold at a lower cost. These lower-cost synthetics have attracted an ever-growing number of customers who like the lower initial price and want the improved protection and performance qualities associated with a synthetic, but aren’t ready to extend their drain intervals. AMSOIL has watched the competition infiltrate the market it pioneered. With 92 percent of synthetic motor oil customers purchasing synthetic products recommended for standard drain intervals, AMSOIL and its Dealers are missing out on the vast majority of the synthetic market. The oil drain interval recommendations for many of today’s vehicles extend well beyond the traditional 3,000-mile interval. Ford recommends 10,000-mile drain intervals with its 2011 vehicles, while vehicles equipped with electronic oil monitoring systems often extend drain intervals up to and even beyond the 10,000-mile mark. Although OEM-recommended drain intervals continue to rise, the installer market has mostly been resistant to this change. In fact, 90 percent of do-itfor- me (DIFM) oil change businesses continue to recommend 3,000-mile drain intervals to their customers. The DIFM market is expected to account for 80 percent of all oil changes by 2018, and penetrating this market is essential to ensure future growth. Although AMSOIL Dealers have developed very successful installer accounts centered around XL Synthetic Motor Oils (which were developed to overcome installer objections related to price, warranty and API certification), there is still resistance from many installers who fear that extended drain recommendations limit their profit potential. Recommended for extended drain intervals, AMSOIL synthetic motor oils comprised the entire synthetic passenger car motor oil (PCMO) market in 1972. In the years since, competing synthetics recommended for OEM drain intervals have taken the majority of the market share. In order to meet the demand for a lowercost synthetic motor oil, and to provide customers a stepping stone to the toptier line of AMSOIL synthetic motor oils, AMSOIL is introducing the AMSOIL OE Synthetic Motor Oil line. Priced competitively with other standard-drain synthetic motor oils, OE Synthetic Motor Oils offer the protection and performance benefits of a high-quality synthetic for OEMrecommended drain intervals, providing Dealers with a huge opportunity to reach new customers. 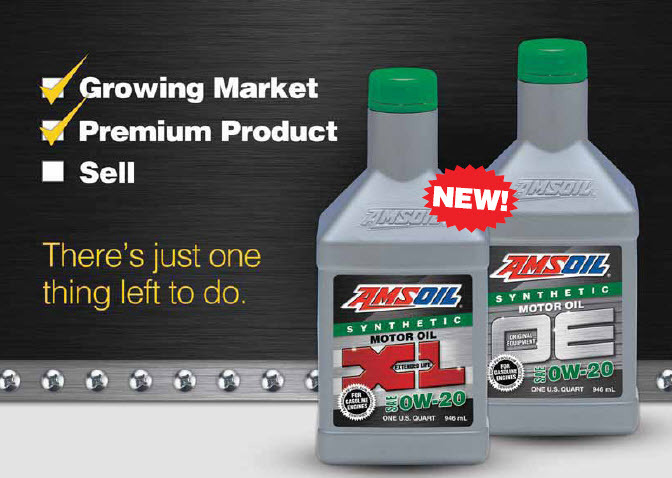 AMSOIL OE Synthetic Motor Oils are ideal for capturing increased sales in the installer market. Because they are API-certified (meet API SN/ILSAC GF-5 requirements), recommended for OEM drain intervals and competitively priced, they effectively overcome all potential objections from installers. Installers now have a choice between offering their customers standard drain intervals with OE Synthetic Motor Oils, extended drain intervals with XL Synthetic Motor Oils, or both. Because customers change oil more often with OE, both Dealers and installers stand to increase profits (see graphs). * Based on 15,000-mile/year national average. While most installers recommend 3,000-mile intervals, most motorists practice 4,500-mile intervals. AMSOIL OE Synthetic Motor Oils will help AMSOIL and its Dealers penetrate a portion of the motor oil market that has been a more difficult sell, including the installer market, commercial fleets, cost-conscious customers and customers hesitant about taking advantage of extended drain intervals. See the Voice-over PowerPoint Presentation in the Dealer Zone for more details about OE Synthetic Motor Oils, why they’re needed and how Dealers will benefit.